All non-EU citizens intending to stay in Italy for longer than a week must let the local government know within 8 business days. For Miss G and I, this meant filing a Dichiarazione di Presenza (declaration of presence) at Cinformi. Cinformi is the province of Trento’s immigration services office. They are located at Via Zambia 11. Like many things in Trento, Cinformi took some finding. The best landmarks for the obscure office are that the building is directly behind Via Brennero’s “Top Center” mall and door 11 is in the center of the building, adjacent to a “Loro” baby store. 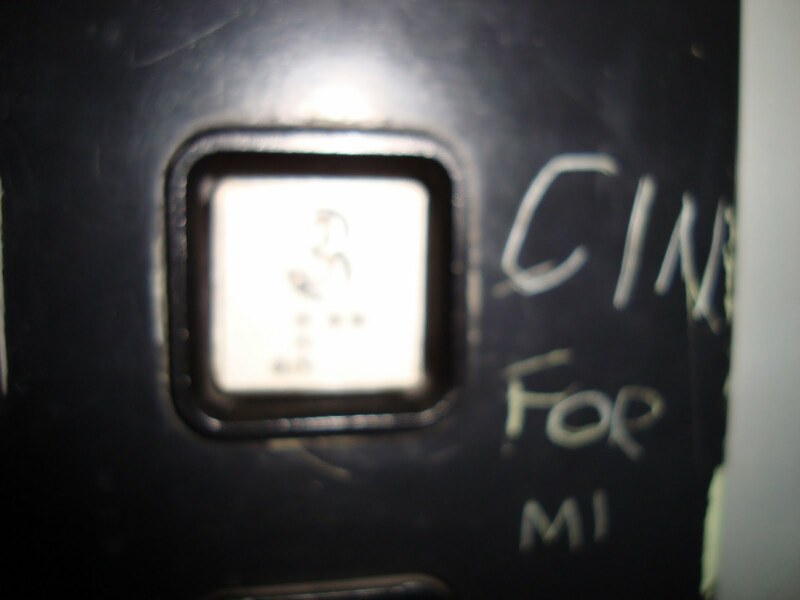 Cinformi is on the third floor, and some frustrated immigrant has helpfully scratched the word “Cinformi” on the elevator controls next to the #3 button. When you enter the office, take a number. We arrived about 30 minutes after opening and didn’t have to wait to speak to the front desk people. At the front desk, state your reason for being at Cinformi, or better yet have it written–only Italian and German spoken here. Based on your reason for being there, reception will hand you any necessary forms to fill out and another number. These numbers are more specific because they’re linked to what kind of services you need that day. I was waiting to present myself so my number said “Presentazione 119.” Other numbers might be for visas, and I saw one category simply called “Informazione.” A monitor above the front desk lists seven or eight categories and numbers currently being served. Soon after I started filling out my form (which thankfully had instructions in Italian, Spanish, English, French and German), I noticed that “Presentazione 120” was being served. At the California DMV–the office upon which I base all bureaucratic comparisons–missing your number being called means you’re pretty well screwed because you’ll have to get a new number and wait your turn again. I hurried to the front desk, pointed to my number, then the monitor, and managed to say something like “but e cento-venti,” which is atrocious non-Italian, but the lady understood. She asked if I had filled out “tutti le forme” and I shook my head. I only had my name and birthday down. She then said something in Italian that sounded reassuring, so I sat down and continued with the forms. As I filled in the forms, the receptionist took both passports from me and came back a few minutes later with photocopies of all pages. As soon as I was done, I looked up and the receptionist was smiling and pointing to the monitor… my number!! She showed me a spot where I could park Greta’s stroller, and Miss G and I proceeded to the numbered desk that coincided with the monitor. Here, I handed over the passports, photocopies and forms to another Cinformi employee. She compared the info on the forms to the passports themselves, then signed and stamped the forms and gave them back to me. She wrote a date at the bottom of the forms and made it clear that we have until 30.03.10 to leave the country or apply for a more permanent visa. Everyone around here rolls their eyes and complains about Italian bureaucracy, but this part was easy. The entire Declaration of Presence event took thirty or forty minutes. It might have taken only twenty-five, but Italians love babies and the receptionist, the woman who notarized our forms, and another man in the office who answered some questions for me in English — all three Cinformi workers stopped at some point to smile and chat with G and say how beautiful and happy she is. In fact, the woman who received our Declarations came from behind her desk, picked G up and had a long chat with her, in Italian, about who knows what. You don’t see that at the DMV. Perhaps having a cute baby makes Italians happy and friendly and a bit more helpful than they might otherwise be, but it was also important that we were there early. The office opens at 9:00, and when I arrived at 9:30 there was one man ahead of me at the front desk and one or two people waiting for their official numbers to be called. When I left, more than a dozen people sat in the waiting room chairs, looking a bit uncomfortable and resigned (the DMV effect). The office gave me the impression that waits are more the norm. For instance, there are a lot of chairs. Also, for parents, Cinformi anticipates that you may have to sit and wait with children: there’s a small play area in the corner with a toddler-sized plastic play house, and there’s a changing table with diaper pail in the women’s restroom. It’s great that they have these, but it’s also an indication you’ll need them. I have other suspicions about why this first contact was so painless. Whereas visas are involved and iffy and require a lot of complicated documentation, the Dichiarazione di Presenza is no big deal. Italy wants you to come and stay and declare yourselves–and then to leave in 90 days or less. But G and I have no intention of leaving by 30.03.10, so we’ll see how the rest of the process goes. This entry was posted in Uncategorized and tagged Italian Red Tape, Language Barrier, Moving to Italy, Trento. Bookmark the permalink.